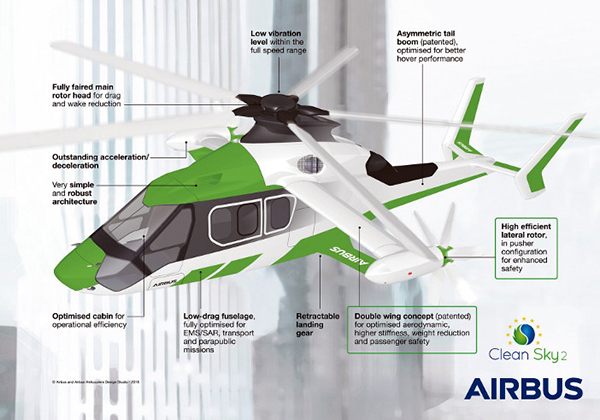 aerobd.news : There is a lot of excitement and interest in Racer (Rapid And Cost-Efficient Rotorcraft) helicopter, a technology demonstrator being developed by Airbus Helicopters. The clock is ticking towards a planned first flight at the start of 2020 and Airbus engineers are working hard to meet the deadline. The Racer demonstrator is a compound helicopter designed to be 50% faster than conventional helicopters, with a cruise speed of up to 400km/h (250mph), while being around 25% cheaper to run. The Racer project also aims to reduce the noise footprint and the fuel consumption compared to conventional helicopters by 15% and double the possible range achievable in one hour. Compound helicopter’s key characteristic is that they are faster than conventional helicopters in horizontal flight. The performance improvement is achieved through the use of fixed wings and lateral rotors in combination with the traditional main rotor. Racer features a box-wing design that provides lift in cruise mode while isolating passengers during ground operations from the pusher lateral rotors, which generate thrust in forward flight. The design builds on research carried out on the Airbus Helicopters’ X3 demonstrator. The box wings are joined at the tips by the propellers’ bullet-shaped casing and are a key part of the helicopter’s design. The wings enable a good cruise efficiency, while they also have a small surface area above, which minimizes their interaction with the main rotor wake when the aircraft is in hover. The two lateral propellers provide thrust for high-speed cruise and counteract the main rotor’s torque effect in hover, replacing the role of the tail rotor. While hovering, the asymmetric tail boom benefits from the interaction from the main rotor wake to provide a significant contribution to the anti-torque function. Racer transitions from vertical to horizontal flight gradually. As the helicopter’s speed increases, the wings progressively take over the job of producing lift and the lateral propellers take over for forward motion. At the time of writing, the first parts of the rotorcraft are being manufactured, with final assembly of the prototype scheduled to start towards the end of 2019. Airbus Helicopters has already started producing the lateral drive shaft, one of the Racer’s most complex components. Meanwhile, several companies from across Europe are producing parts for the aircraft. Italy’s Avio Aero, a GE Aviation Business, is producing the lateral gear box’s housing, while Hamble UK based GE Aviation Integrated Systems is making the wing’s titanium cradle. Romania’s INCAS/Romaero is manufacturing the Racer’s composite side panel and Spain’s Aernnova the tail part’s primary structure. A two-phased, 200-hour program of flight testing for Racer is expected to begin at the start of 2020. The first phase of flight testing will focus on the progressive opening of the flight envelope and on assessing key performance objectives as well as speed, handling qualities, stability and aerodynamics. The second phase will aim at demonstrating the aircraft’s suitability to carry out potential missions with increased speed and efficiency. These include emergency medical services, search and rescue and private transport. This second flight testing phase will also develop low-noise flight procedures. There are both challenges and opportunities for engineers in Racer’s testing program. The innovative nature of the rotorcraft means that the testing program requires advances in flight test instrumentation (FTI) and data acquisition (DAQ) units. One of the toughest parts of the testing setup has been identified as the acquisition of data between the rotating parts of the helicopter and the fuselage. The system has to acquire and transmit 64 data parameters from the main rotor, 32 per lateral rotor and also data from within the transmission shaft inside the wings. The main use for the data obtained will be to optimize the operation of the rotors on the prototype. Speaking at an event in Paris, France, during May 2018, Marc Seznec, head of FTI architecture and measurement for Airbus Helicopters said, “The question is, can we innovate to enable the transfer by wireless of a large amount of data in the flight test domain of the helicopter, so we can take into account such a high number of parameters.” After a tendering process the task of developing and supplying the data acquisition units for Racer’s wireless data acquistion system was awarded to French firm Zodiac Aerospace as part of an EU-funded project called HIRIS (Helicopter Innovative Rotating Instrumentation System). HIRIS is being tested before its use in Racer. The first test flight for HIRIS is planned to take place before March 2019. Three different devices are being developed for Racer’s rotors and the drive shaft system. The devices will use a hybrid solution of proven technologies to ensure energy transmission on rotating parts and be contactless and wireless. The main rotor has 64 parameters that have to be acquired, with a unit on the rotor head. The connection between the sensors and the DAQ is wired. “It’s a large amount of data, 64 parameters. That data will then be transferred wirelessly to a gateway on the FTI table within the main structure of the helicopter,” said Seznec. Engineers have provided a wireless supply of power between the fixed part of the instrumentation and the rotating parts. “This power supply is monitored so we know the status of the sensor. We need to know if it is working and if we are at risk of losing power,” said Seznec. Instrumentation for the lateral rotors’ uses a similar approach to the main rotor, except that the acquisition unit is fitted on to the side of the casing. The devices also transmit data to a gateway on the table and power is wirelessly transmitted to the fixed part from the rotating parts. Seznec said, “The instrumentation in the shaft system is different. On each side there are three different shafts. One inputting power from the engine, one outputting power and the driveshaft. We are using soft-coupling and each has to be equipped with two quarter bridge sensors and one temperature sensor.” The DAQs have to be able to withstand 2000rpm on the main rotor, 1500rpm on the lateral rotors and up to 9000rpm within the driveshaft, with margins for overspeed as well as temperatures of up to 100˚C and zero effect drift. The team also has to verify that all of the sensors are in the correct position and calibrated, while allowing for the possibility of any electromagnetic interference and ensuring that the power supply remains consistent. “We will take particular care where there is high speed rotation, because the shaft must be balanced. At the end we have to balance every shaft with the equipment attached, which is difficult,” said Seznec.